At around 120,000 feet, on the fringes of space, the air is so thin that a falling human body would travel fast enough to exceed the speed of sound. A skydiver, properly equipped with pressurised suit and a supply of oxygen to protect against the hostile elements, could feasibly jump from that height and, about 30 seconds later, punch through the sound barrier – becoming the first person ever to go “supersonic” without the aid of an aircraft or space shuttle. Baumgartner has been plotting his space jump for four years, Fournier for 20, and this autumn both projects are coming to a head – 50 years exactly since anyone even came close to leaping from such heights or plummeting at such speeds. That was Colonel Joseph Kittinger, a test pilot, who completed a series of high-altitude jumps from a helium balloon in August 1960, part of an equipment-testing project for the agency that would become NASA. It can’t be done from an aeroplane (even a spy plane can only ascend to about 80,000 feet), nor from a rocket (any hopeful parachutist opening the hatch to jump out would be torn to pieces). Ballooning directly up is the only realistic option, but an option still fraught with difficulties. A helium balloon launched into the stratosphere needs continually to enlarge because of the changes in atmospheric pressure, and so must be made of a special expandable material that is less than a 1,000th of an inch thin; clingfilm thin. It also needs to be huge, about the size of an office block. 3) “Explore the World with Street View, Now on All Seven Continents” [Official Google Blog] – Google is making its presence felt, once again. 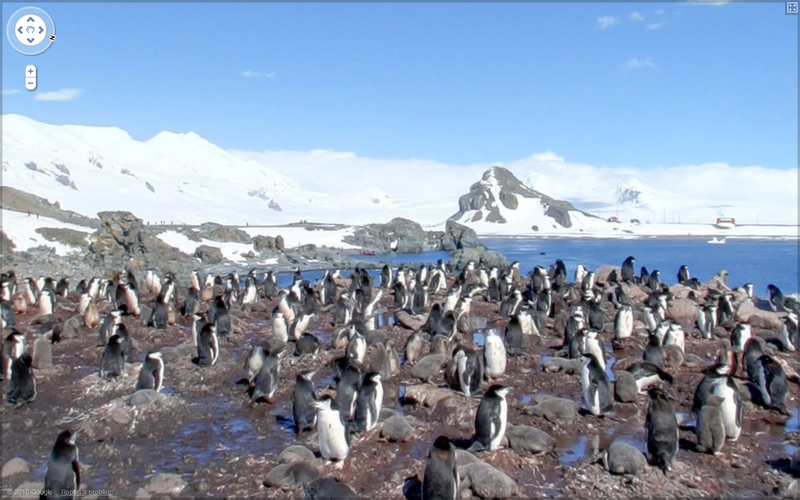 This time, they sent an expedition to Antarctica and came back with views like this. The question: how much do penguins care about privacy? Imagine this scenario. You go on a date with someone for the first (or even the second time). You’re making lovely conversation, asking the usual: what do you do? What are your hobbies? What are your favorite movies? If you’re the really nerdy type, perhaps the conversation turns to math and you’re able to massage a timely trivia question into your conversation. As you’re asking these questions, there is that one nagging question that you want to ask, but don’t. And based on the looks of things, your date wants to ask this question as well. What you and your date really want to ask each other is this: your thoughts on marriage. You sense it in your date’s body language and facial expression: the way the eye twinkles, the brow furrows, the nose twitches. Is there a word to describe how you’re feeling about this situation? Turns out, there is no one English word to describe how you and your date feel. But there is such a word in at least one language of the world: the Yaghan language of the Tierra del Fuego (in Chile). The word is Mamihlapinatapai and can be roughly translated as “a look shared by two people with each wishing that the other will initiate something that they both desire but which neither one wants to start.” Pretty amazing, huh? Wikipedia cites Mamihlapinatapai as one of the hardest words to translate (that’s a link to a fascinating article in Wikipedia). A similar construction occurs in Russian, where “I have” translates literally into at (or by) me there is. Russian does have a word that means “to have”: иметь (imet’) — but it is very rarely used by Russian speakers in the same way English speakers use the word have; in fact, in some cases, it may be misinterpreted as vulgar slang for the subject rudely using the object for sexual gratification, for example, in an inept translation of “do you have a wife?”. Can you think of any other words/phrases in foreign languages for which there is no (simple) English equivalent? My favorite has to be Schadenfreude, which is a German word which doesn’t have an English equivalent but roughly translates to “pleasure derived from the misfortunes of others.” Feel free to share your favorite non-translatable word in the comments. ‘My grandfather was the Second Officer on the Titanic,’ Patten explains. ‘He was in his cabin when it struck the iceberg. Afterwards, he refused a direct order to go in a lifeboat, but by a fluke he was saved.’ Astonishingly, he jumped into the ocean as the boat sank, was being sucked down into the depths – but was then carried back to the surface by the force of an explosion beneath the waves and was rescued by a passing lifeboat. If you’re still confused, check out a simplified explanation at Discovery News. And what of the must-read books? Of course there is no such thing as a must-read book. Maybe you should read some Tolstoy, but then again maybe not, if overly long descriptions of fields don’t really do anything for you, or if you have some problems with the whole woman-has-a-desire-and-so-must-die thing. Maybe you should check out some Jane Austen, but then again, Jane Austen is pretty boring and the whole marriage-as-life thing, I mean who really cares. There is Shakespeare, but you could spend a day arguing Hamlet versus King Lear versus Julius Caesar and never have a clear winner. “Best book of the century” is the statement of someone who has given up. That is an incredibly pessimistic viewpoint to have, don’t you think? That 10 years into the century, this is the best we can possibly do? Or perhaps he means the last hundred years. Maybe the guy really didn’t like Ulysses; it’s hard to tell. It’s not that the guy didn’t like Ulysses; it’s that he never actually read it. The $100 million for Newark is the initial gift to start a foundation for education financed by Mr. Zuckerberg. This would be by far the largest publicly known gift by Mr. Zuckerberg, whose fortune Forbes magazine estimated last year at $2 billion. The gift is many times larger than any the system has received, officials said — an extraordinary sum not only for a district with an $800 million annual operating budget, but also for any publicly financed government agency. It is not yet clear how the money would be used, or over what period. This is Zuckerberg’s first major act of philanthropy, and no doubt it’s huge. He would have made the headlines had he contributed even a tenth of his $100m pledge. I came across such a piece of writing last week, and it was Brian Phillips’ masterful essay, “Pelé as a Comedian.” As I was reading through the essay, I felt chills go down my spine. This is how incredible the writing is. I don’t often say that something is a must-read, but this is an absolute must-read. It doesn’t matter if you’re a fan of football (soccer); it doesn’t even matter if you like sports. You should read this essay if you appreciate beautiful and compelling writing. So do yourself a favor, head over to the Run of Play blog, and read it. Over the last 50 years, the city of Detroit has lost more than half its population. So has Cleveland. They’re not alone: Eight of the 10 largest cities in the United States in 1950, including Boston, have since lost at least 20 percent of their population. But while Boston has recouped some of that loss in recent years and made itself into the anchor of a thriving white-collar economy, the far more drastic losses of cities like Detroit or Youngstown, Ohio, or Flint, Mich. — losses of people, jobs, money, and social ties — show no signs of turning around. The housing crisis has only accelerated the process. In Detroit, a city that now has more than 40 square miles of vacant land, Mayor Dave Bing has committed himself to finding a way to move more of the city’s residents into its remaining vibrant neighborhoods and figuring out something else to do with what remains. A growing number of cities and counties are creating “land banks” to enable them to clear the administrative hurdles that previously prevented them from taking control of blighted blocks of abandoned homes. Born on June 22, 1907, in Hutchinson, Kan., Judge Brown, who had become a prominent local Democrat, first sought appointment by President Harry S. Truman to the federal bench while serving as a lieutenant in the Navy during World War II (at 37, he was the oldest man in his unit). He failed, but in 1962, after a stint as a bankruptcy judge, he was appointed to the district court by President John F. Kennedy He earned a reputation as a pragmatic jurist whose middle-of-the-road rulings reflect a desire to apply rather than make the law. Judge Brown is still working, probably because he loves his job (or is totally dedicated to it). While the article is UK-centric, it’s worth reading. Are we confusing cause and effect in the relationship among dieting, exercise, and weight loss? I find this fact fascinating: I knew that Goldman had partners at its firm (even though the company is public), but I had no idea that partners could have been unmade. This is in stark contrast to academia, where a professor who has attained tenure usually will not be stripped of the status unless he does something completely stupid. 2) “Atlanta Awash in Empty Offices Struggles to Recover From Binge” [Bloomberg] – an insightful piece explaining how the recession is still deep, especially in my hometown, Atlanta. Bank of America Corp., the largest tenant in the 55-story tower, plans to reduce its space to 13 percent from 30 percent and cut its rent to about half the current $36.65 a square foot, according to the watch-list data. Atlanta’s homebuilders, who had led the nation in single- family construction permits from 1995 to 2005, have been largely idled. Permit volume declined 91 percent from 2005 to 2009, according to the Census Bureau. A lot more sobering statistics in the Bloomberg piece. Of course, our undergraduate students will read rigorous academic studies of the urban job market, education and the drug war. But the HBO series does what these texts can’t. More than simply telling a gripping story, “The Wire” shows how the deep inequality in inner-city America results from the web of lost jobs, bad schools, drugs, imprisonment, and how the situation feeds on itself. Powerful. Certainly a strong testament that education can go beyond the textbook. If you’re reading this post, then chances are you’re probably on Facebook. Or at least have heard of it. The latest piece in The New Yorker, “The Face of Facebook,” offers an intimate, revealing look into the founder of Facebook, Mark Zuckerberg. It’s definitely a piece worth reading, not least because it goes on to show how Zuckerberg has changed since his younger days at Harvard. I highlight some passages which I found interesting below. With whom is Mark friends with on Facebook? And what are Zuckerberg’s favorite artists? (More about his favorites in a moment). According to his Facebook profile, Zuckerberg has three sisters (Randi, Donna, and Arielle), all of whom he’s friends with. He’s friends with his parents, Karen and Edward Zuckerberg. He graduated from Phillips Exeter Academy and attended Harvard University. He’s a fan of the comedian Andy Samberg and counts among his favorite musicians Green Day, Jay-Z, Taylor Swift, and Shakira. He was this nerdy guy who was just a little bit out there. I remember he had these beer glasses that said ‘pound include beer dot H.’ It’s a tag for C++. It’s like college humor but with a nerdy, computer-science appeal. When he’s not interested in what someone is talking about, he’ll just look away and say, “Yeah, yeah.” Sometimes he pauses so long before he answers it’s as if he were ignoring the question altogether. The typical complaint about Zuckerberg is that he’s “a robot.” One of his closest friends told me, “He’s been overprogrammed.” Indeed, he sometimes talks like an Instant Message—brusque, flat as a dial tone—and he can come off as flip and condescending, as if he always knew something that you didn’t. What is Zuckerberg’s ultimate goal? I asked Zuckerberg about “Ender’s Game,” the sci-fi book whose hero is a young computer wizard. I think The New Yorker piece paints an honest portrait of Zuckerberg. While he may have been slightly immature in his teens and earlier twenties, he has grown up considerably over the last few years. I have a feeling that if I were to meet Mark in person, we’d get along.